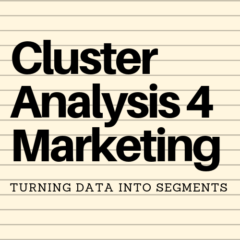 Another very worthwhile output from the free Excel cluster analysis template is the size of each of the market segments. This information will come in handy for estimating the total size of each segment, as well as its financial viability for the firm. This information is shown on the output page – right below the averages for each marketing variable, as shown in the diagram. For this same example, we can see that 25 respondents have been allocated to Segment 1, 28 to Segment 2, and so on. Because, in this example, there are 100 respondents, the percentage of the total market per segment is the same (e.g. 25%, 28%, and so on). You need to use the percentage column only for your further analysis. You can then apply this percentage to the total market size to estimate the size of each segment. In this example there are 25% of the respondent allocated to Segment 1. If, for example, there were 1,000,000 consumers in this market – then we can estimate that 250,000 of these consumers belong to Segment 1.